Roasted Red Pepper Soup | Naturally. A couple post back, I talked about my general cranky demeanor and my wanting to get out of a funk. I was positive, went for walks, and ate pretty darn healthy and the end result: nothing. I’m beginning to wonder if there is something medical going on (I have my suspicion) and because of this, I’m headed to the doctor tomorrow. In the mean time, I attempted to comfort myself with a nice warm bowl of soup. We’ve had some crappy weather (rain, hail, and snow all in one night) along with some cooler temperatures and this makes me crave a nice big bowl of warm soup. I ended up using jarred red peppers because I really hate buying out-of-season veggies if I don’t have to and since I had a jar sitting in the cupboard it was the perfect excuse to cheat a little. 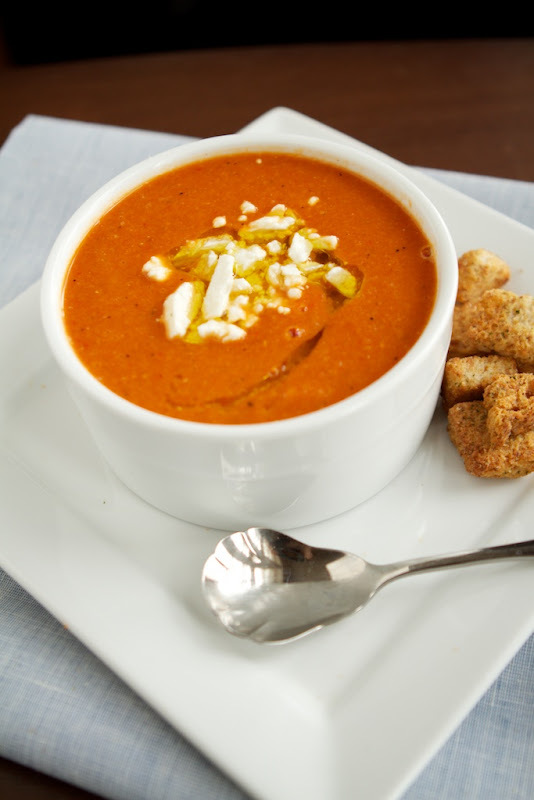 This soup is really simple and if you left the feta off the top, could also be vegan. The lentils add a little extra oomph in the red color and a little extra creaminess to the soup. This was the perfect soul satisfying soup I needed today. In a medium pot, heat olive oil over medium. Add in onion, sauteing until becoming translucent. Stir in garlic and continue to cook for two more minutes. Remove roasted red peppers from the jar (or remove the skin if you roasted them yourself) and dice. Combine pepper, paprika, salt, and pepper and stir into onions. Cook for two more minutes. Finally, pour in veggie broth and lentils. Lentils will absorb some of this broth so be sure to have a little extra broth on hand just in case you need to thin down the soup. Bring soup to a boil then reduce to simmer and let cook for 15-20 minutes or until the lentils have softened. Remove from heat and puree with an immersion blender. Dish into bowls and top with a little oil, feta, and croutons if you like. This looks great! It’s pretty hard to get jazzed about lentil soup anymore — been there done that — but I’m totally making this. This looks great. It seems light on the calories. Is that right? I love soup and this looks amazing! I hope you get to feeling better and find some answers. 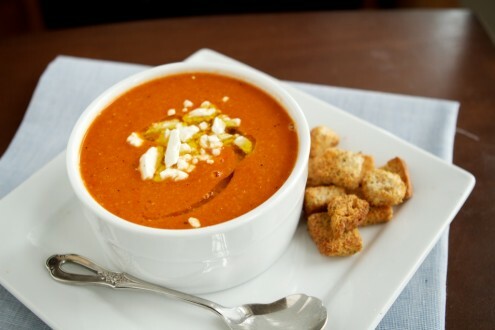 I looove roasted red pepper soup, but I’ve never made it myself before. It looks pretty simple! I buy our jars of roasted red peppers at the dollar store, way cheaper than the grocery store! Can’t wait to try this! Your soup looks great, Erin. Hope everything’s okay with you! 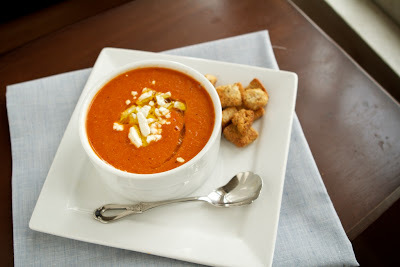 I made this soup for a party I had in the Spring when the weather was still a bit chilly. It was a big hit! I also made the jalapeno cheddar biscuits to go with it which were big hit too! So many people asked me for the recipes and of course i passed them on! Your food is very popular in Prague, and everyone thinks i’m a great cook even though i tell them i just followed your recipes! Made this soup today, being short of time I didn’t bother to skin the peppers after roasting. All the family liked it including our toddler grandson, so will definitely make again. Thank you for a quick and tasty recipe! I made this soup and, I’m telling you, it was out of this world delicious! I only have green lentils on hand – will that work or do I have to specifically use the red lentils? I also like that Nat said you can get the jar of red peppers at the dollar store. Will have to look for them. Thanks for posting this recipe. Will definitely make it. The red lentils are split and don’t contain the outer shell, which makes them cook down/abled to be pureed. The green lentils are not split and hold there shape, which means while you could potentially use them, the end result would be different! This is delicious and so simple and also cheap! I made a batch before Christmas and was just reminiscing so came searching for the recipe – will be making some more tonight 🙂 thanks so much!